Pretty 2 new and independent 55m2 house rooms in the ground floor. Large terrace and garden. Very quiet. A pleasant Living 34 m2 tastefully decorated (Living room, Dining room, bar, kitchen). A large 18m2 bedroom with a bed of 140. Bathroom with Italian shower, wc. TV in the living room and bedroom. WIFI access. The summer garden furniture available, sunbathing and plancha. Following a very warm welcome by Martine and Alain we were shown around a really lovely, spacious and beautifully furnished apartment with a massive lounge and dining area, a god sized bedroom with and office facility and a newly installed shower room. There was also a very big patio looking over the garden and the fields and woods beyond. Our hosts had provided a mountain of patissarie and a big dish of gorgeous charcuterie which was a meal in itself. The apartment is conveniently located for Bourges and the host of surrounding villages, the internet is brilliant and we were able to watch UK tv through our laptop when required and we enjoyed our time chatting to Martine and Alain over aperitifs the evening before our departure. We would really recommend this accomodation as it is practically home from home. 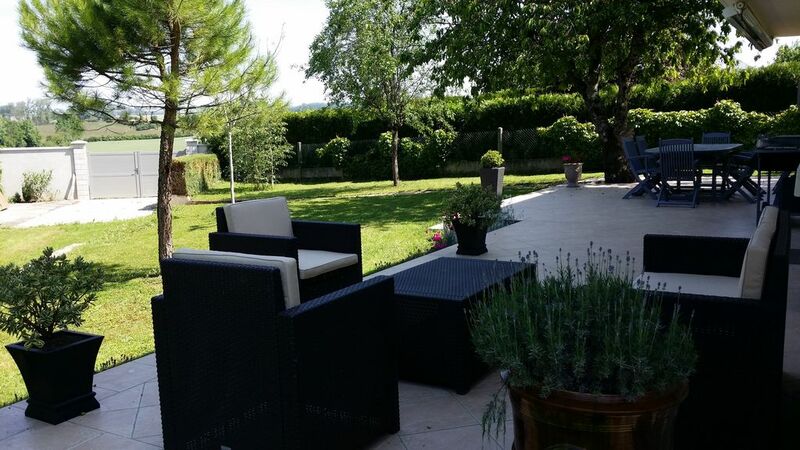 We have no hesitation in awarding this property five stars and would most definitely stay here again if and when we are in this area of France. Although we arrived about an hour earlier than we had planned, we were met by the very gracious hosts, Martine and Alain. They have traveled widely themselves, and both speak excellent English. The apartment is as described. It is very spacious, well-equipped, and with beautiful decorations from their travels. Martine left a tray of breakfast breads and other good things to eat, as well as various items in the refrigerator. The WiFi worked very well. Parking was included, private, and secure. It is about a 10-15 minute drive to a free parking lot in the beautiful city of Bourges. I recommend this apartment very highly. My wife and I stayed a week in this lovely apartment. It has a private entrance and you have your own parking place. The apartment is spacious and well equipped and has a porch with easy chairs and a sunny garden with a beautiful view over the countryside. Walking route is just outside the entrance. There are enough restaurants in the neighborhood but we enjoyed buying delicious local products and cooking ourselves. There is enough culture in Bourges and further along the Loire. We had a holiday as a holiday should be, thanks also to our hosts would made us feel very welcome. Much recommended and we consider going back there again. Thank you for your gracious hospitality during our week in Bourges. What a wonderful stay. You may us feel as welcome as one of the family and as comfortable as if we were at home. Your example has pushed us into trying to do a HomeAway ourselves in Pensacola! Your place is appointed with artifacts from around the world, making us feel like world travelers - Oh, we are! The happy hours you hosted and recommendations on places to see were like icing on the cake! You just kept doing extra things for us, and made us feel Special. We would like to extend a special thanks for purchasing a microwave because that was how we were used to cooking. That was over and beyond. This apartment is just about 15 minutes away from Bourges and easily accessible to many historic sites. It is also a wonderful place if you want to bike or walk around. We took a day trip to Paris by train and we loved it. We do recommend a car for visiting the sites. There are many chateaus, parks, castles and shopping areas to visit. The home and the owners were both a delight. Beautiful gite and wonderful hosts! Located 3 kms from CREPS Bourges.